So much for The Bachelorette's much-ballyhooed perfect relationship record. Last year's The Bachelorette 2 couple is no more, with Meredith Phillips and Ian McKee having announced yesterday that they have ended their relationship. Is the bloom finally off the Bachelor franchise rose, or did much of America just agree that Meredith made a rather boring bachelorette? "With This Gumball I Thee...,'" our episode summary for the finale episode of ABC's second edition of The Bachelorette, written by AMAI, is now available. Stating she preferred "passion" over "stability," Meredith Phillips chose former New York investment banker and current vagabond Ian McKee over Texas pharmaceutical salesman Matthew Hickl during last evening's finale of the second season of ABC's The Bachelorette. Last week's penultimate episode of ABC's second edition of The Bachelorette drew 11.33 million overall viewers and a 5.1/12 rating/share in the Adults 18-49 demographic, a performance that ranked it as the network's third most watched program of the week (behind Sunday's Super Millionaire premiere and a special Monday February 16 edition of Primetime). "The Men Tell All-most Nothing,'" our episode summary for the "The Men Tell All" episode of ABC's second edition of The Bachelorette, written by tig_ger, is now available. "And Then There Were Three,'" our episode summary for the sixth episode of ABC's second edition of The Bachelorette, written by quickbrightthings, is now available. "Meredith 'Keeps an open mind,'" our episode summary for the fifth episode of ABC's second edition of The Bachelorette, written by Carrie, is now available. Borrowing a page from CBS' Survivor, ABC has announced that for the first time in Bachelor franchise history, it will air a live broadcast of its upcoming The Bachelorette: After the Final Rose reunion show. "Vying For Love," our episode summary for the fourth episode of ABC's second edition of The Bachelorette, written by buckeyegirl, is now available. "Do You Have a Personality? (and will it work against you?)" -- our episode summary for the third episode of ABC's second edition of The Bachelorette, written by LeftPinky, is now available. "Top Ten Lists," our episode summary for the second episode of ABC's second edition of The Bachelorette, written by dajaki, is now available. "The Love Search Begins Again," our episode summary for the premiere episode of ABC's second edition of The Bachelorette, written by greeneyes, is now available. Meredith Phillips might not have been every Bachelor fans first choice to star in the second installment of ABC's The Bachelorette series, however that clearly didn't stop viewers from tuning into the series premiere. ABC has revealed the names and profiles of the twenty-five men who will be competing for the heart of new The Bachelorette star Meredith Phillips -- as well as some of the new twists and surprises that will be occurring during the second edition of the program. 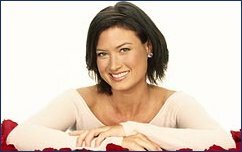 ABC has finally officially confirmed what we've been reporting for a couple of weeks now -- that Meredith Phillips, the third runner-up from Bob Guiney's edition of The Bachelor, will be the woman at the center of ABC's second The Bachelorette series which premieres in January. The December 13 issue of TV Guide magazine (on sale Monday) is confirming the rumor that we've been reporting for a couple of weeks now -- that Meredith Phillips, the third runner-up from Bob Guiney's edition of The Bachelor, will be the woman at the center of ABC's second The Bachelorette series which premieres in January. Apparently her own name isn't that only thing about which E! Online gossip columnist Kristen (who formerly went by the pen name Wanda) is indecisive. When ABC announced that the second installment of The Bachelorette will premiere in January, the network neglected to mention an important detail about the program -- namely the identity of the bachelorette who will star in the series.